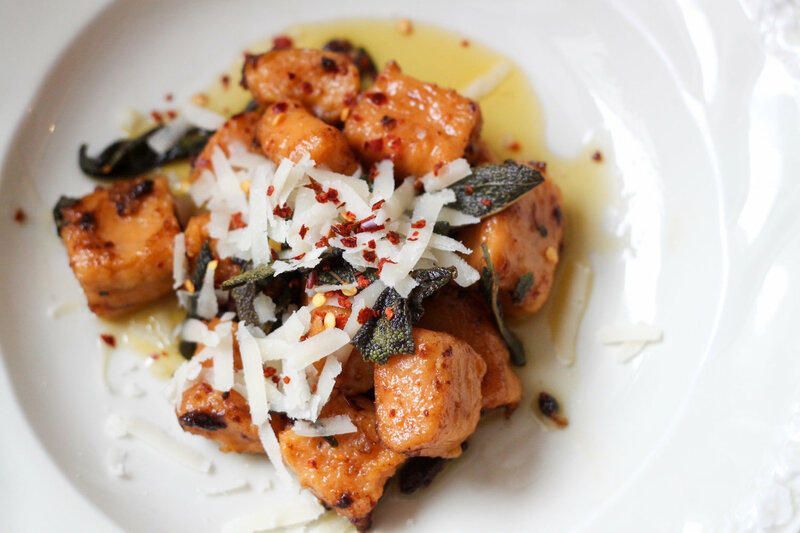 Eternal Musings on Weather: Sweet Potato Gnocchi with Browned Butter – Eat Me. Drink Me. When I first stepped outside this morning on my way to the gym, I said, “Wow. What a beautiful day.” And then I paused. There was no sunshine, and a heavy, gray mist was starting to roll in from the south. The air smelled threateningly of rain and a brisk wind rustled right through my thick fleece jacket. And yet, comparatively, it was a beautiful day. The wind wasn’t bone-chilling, the mist had a lightness, an almost sepia-colored tone to it you might mistake for daylight. In this city, there have been three sun sightings in the last month, and the fall weather I love so much was a tease, a dream dangled before my eyes and whisked away faster than the leaves had time to drop. Growing up, some of my favorite movies were the BBC film versions of the Chronicles of Narnia. There’s a scene in The Silver Chair, where the witch, all snakey and draped in green, casts her magic spell upon the children, Prince Rillian, and Puddleglum the grumpy Marshwiggle. “There is no sun. There never was a sun,” she hisses as the candlelit orb casts shadows in the underground chamber. These days, I often feel like I’m trapped in her world, her scintillating syntax in my ear, “There is no sun. There never was a sun.” And I believe it. It’s amazing what you’ll get used to, what baseline you’ll use to define new norms. Good weather is a gentle drizzle. Bad weather is a noon downpour where the sky is the color of a Secret Service entourage and the wind as unflinching. I know. It’s so incredibly boring to talk about the weather all the time. I feel that I’ve turned into an aged alter ego of myself whose conversations all start out the same way. “Hi there. Nasty weather we’re having.” An obvious-stater. A space-filler. And yet, it occupies so much of my attention. The good thing that’s come out of this miserable mist I live in is that my winter nesting habits have kicked in. I’m finally content to sit on the couch in the evenings and read. I light a scented candle, cuddle up in a blanket, make myself a cup of tea and settle into a dreamy coziness I find very hard to replicate in balmier seasons. And I’m enjoying cooking foods that take a long time to make. Hours of a bolognaise simmering on the stove. A soup burbling away in the kitchen. Hand-rolled pasta and braised meats. 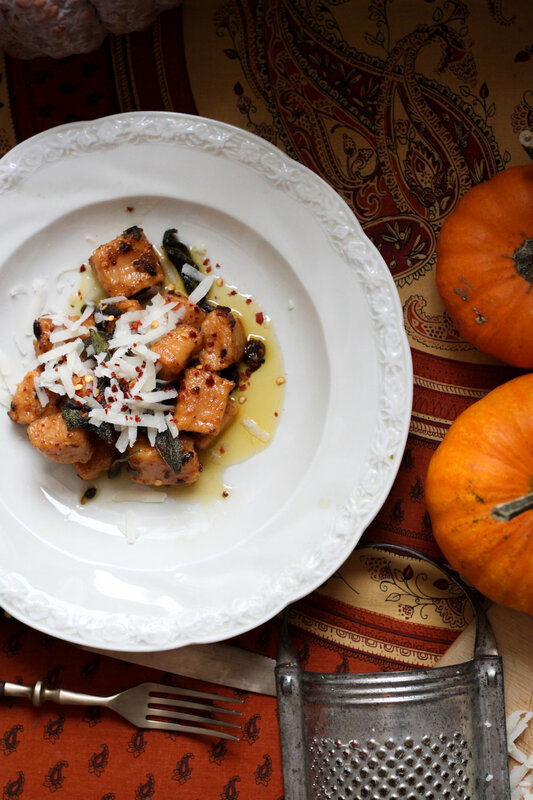 Bring out the hot toddies, apple pies, and slow-roasted pumpkin. Oh gosh, I may even be ready for Glühwein. 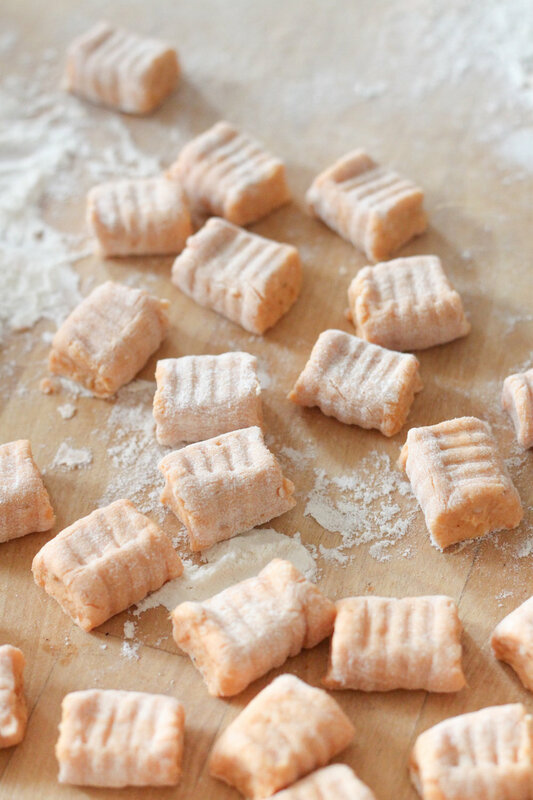 On a recent day much like today – foggy, chilly, dimly lit – I spent a long afternoon making sweet potato gnocchi from scratch. 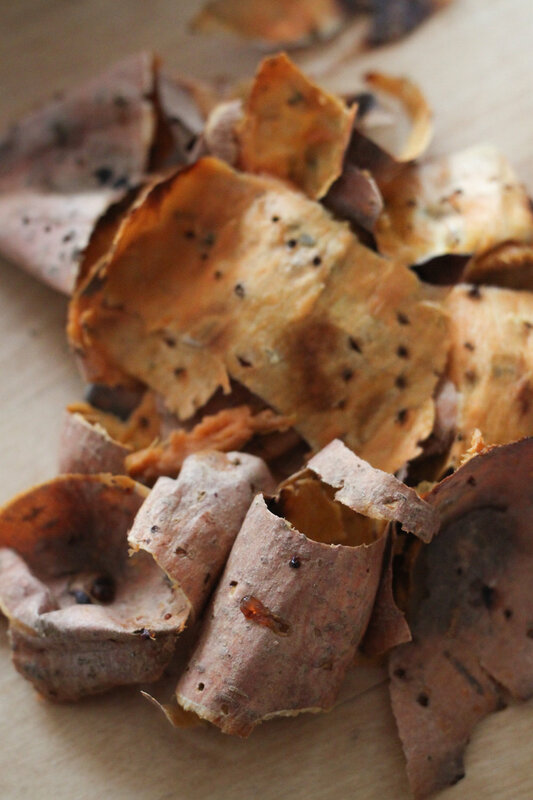 I roasted my sweet potatoes in the morning, freeing them from the oven when they were a gently charred hue of tan, the flesh tender under the tines of a fork. I let them cool while I wrote at my desk, much like I’m doing now, distracted only by the magpies flitting from one rooftop to the next. 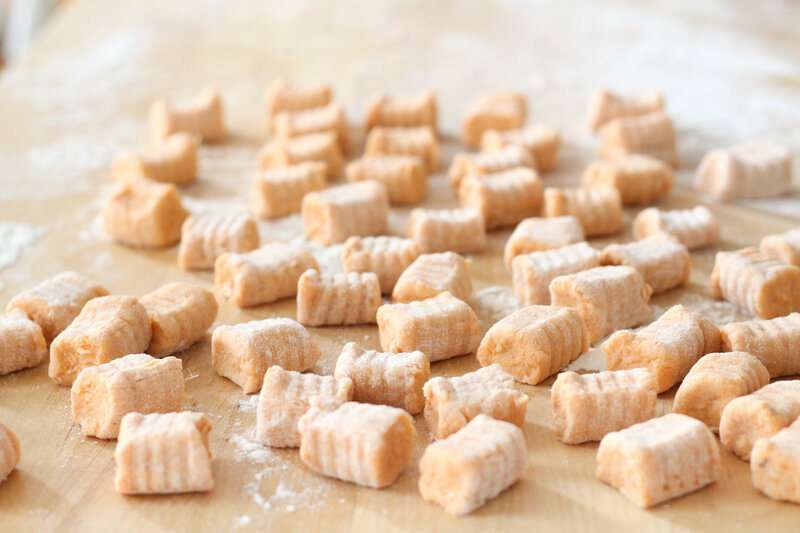 And when the sweet potatoes were cool, I mashed them up with ricotta, parmesan, brown sugar, and nutmeg, then added flour, gently kneading the mass until it was springy and soft, rolling it out into coils and feeling like I was in kindergarten with a handful of Play-Doh once again. 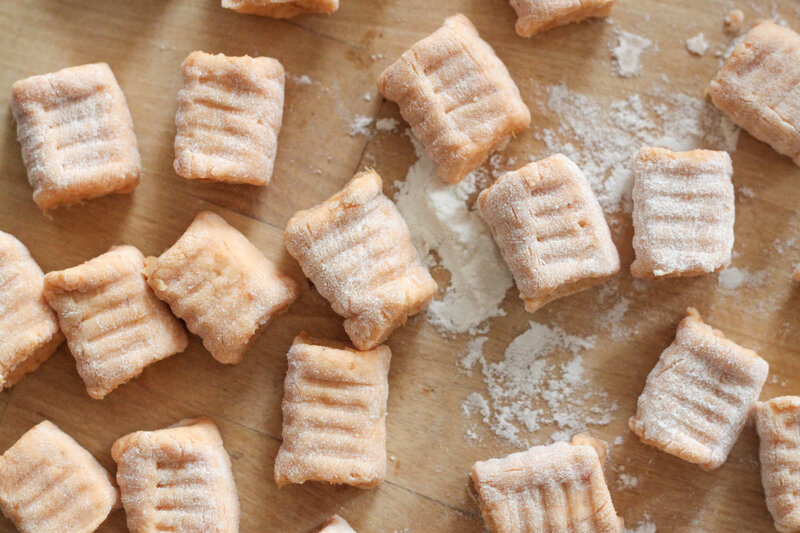 It takes a surprisingly long time to score a pile of gnocchi with a fork, but with a good podcast on play and a schedule cleared for the afternoon, there’s nothing more pressing to do than turn each little pillow of dough into a perfect little pillow of gnocchi. Then there’s the boiling in batches. The requisite six minutes to wait until each batch swims up to the top of the salted pot. The fishing out with the slotted spoon. The waiting until the water is boiling once again. And once all the gnocchi are cooked, there’s also the matter of making a sauce. 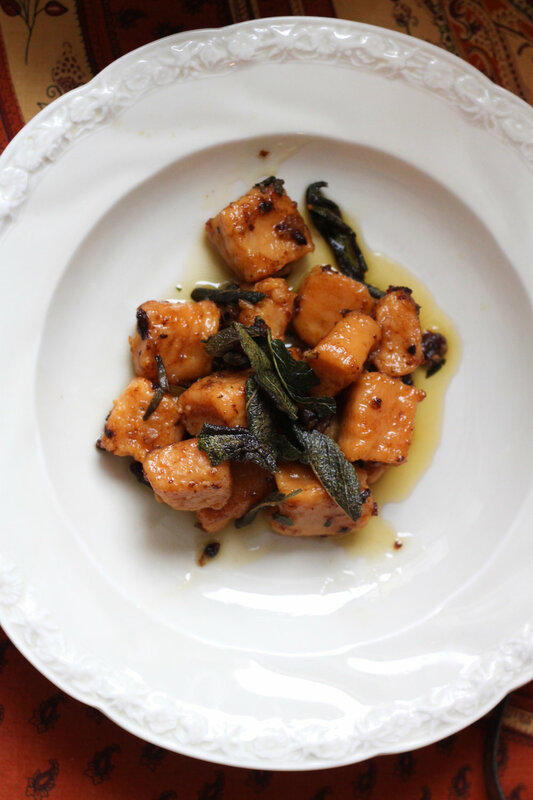 The watching as the butter browns, the crisping of the sage leaves, the way the maple syrup clings to the slivers of garlic and caramelizes them in the pan. 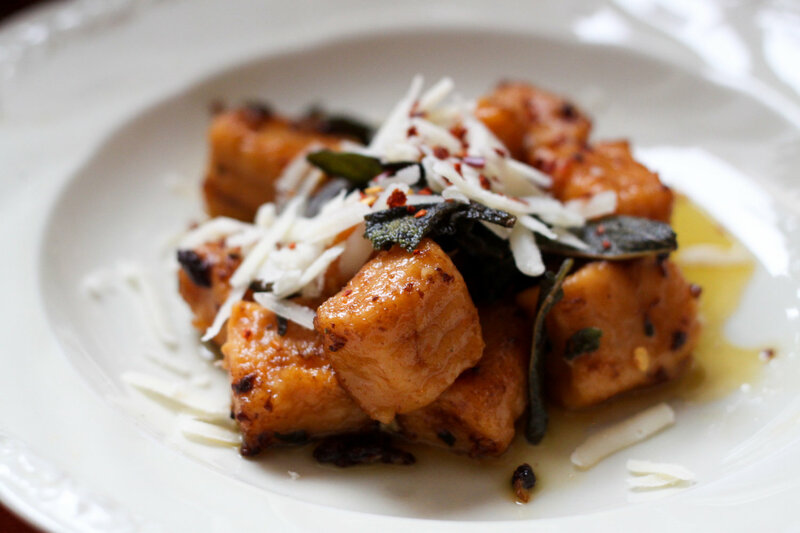 But there’s nothing quite so satisfying after such a long tenure at the stove, than that final fry – tossing the gnocchi in browned butter sauce and serving them up with a healthy shave of parmesan cheese and spicy chili flakes. It’s a meal that feels so very earned, and the perfect antidote to the weather’s grimness: a little bit sweet, a little bit earthy, rich and filling with a flirt of heat and a bite of cheesy tang. Interestingly enough, all this cozy indoor burrowing has left me feeling more energized than I’ve felt in a very long time. I’m excited about upcoming projects, eager to brainstorm, even feeling less dread about those mundane tasks that have been looming on my to-do list for months and months. Or maybe not. That’s giving too much credit to the weather, and we agreed we weren’t going to turn into that person. Not just yet. 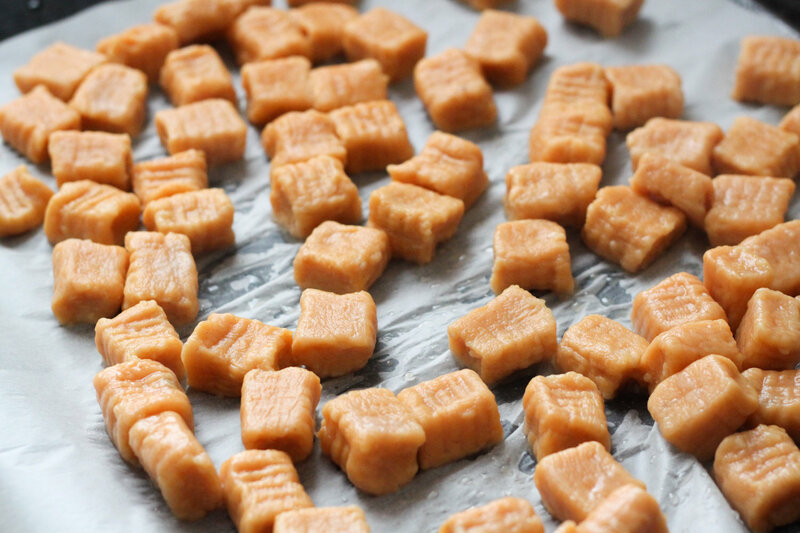 It’s easy to forget to factor in cooling time for the roasted sweet potatoes when you’re thinking about making these gnocchi. I’d suggest roasting them in the morning or even the day before so you can get right to cooking. In general, this dish takes some time to make, making it a great weekend activity. Serves 5, but if you’re cooking for less people, I’d recommend just halving the browned butter recipe and saving the second batch of gnocchi for another meal. 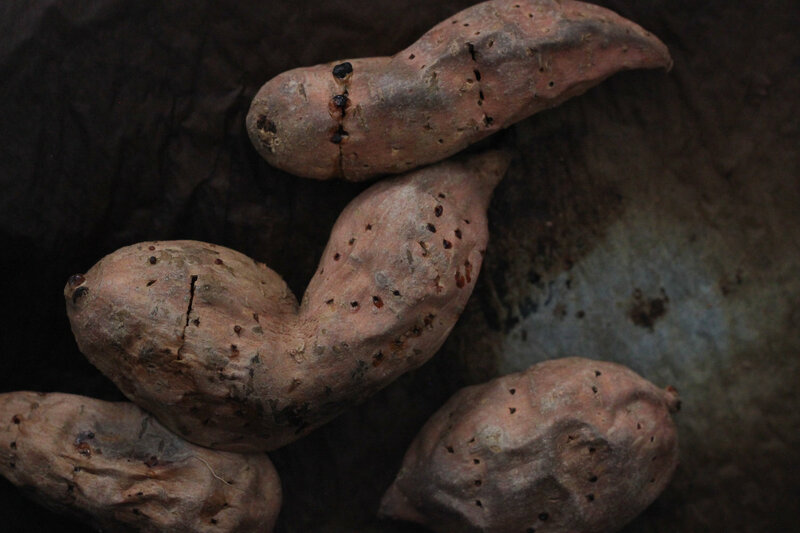 Wash sweet potatoes and poke them all over with a fork. Roast at 480 ºF (250 ºC) for 30 minutes until tender. Allow to cool completely. While the sweet potatoes are roasting and/or cooling, drain the ricotta in a colander for two hours. 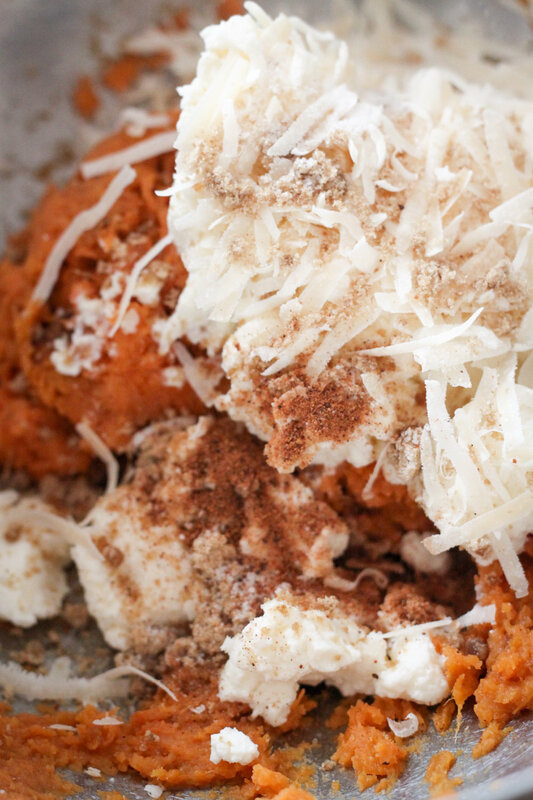 Mash cooled sweet potato flesh (no skins), ricotta, parmesan, brown sugar, salt, and nutmeg together. 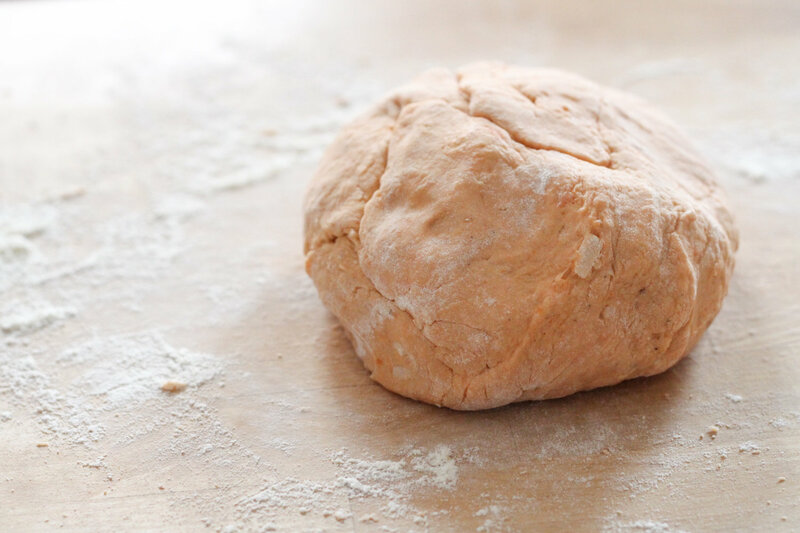 Add flour in ½-cup increments, then turn the dough out onto a floured surface and knead until the flour is incorporated. 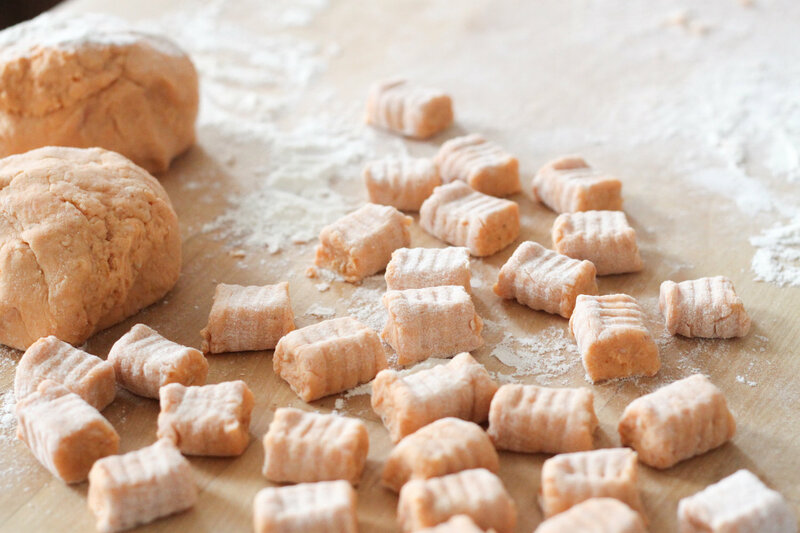 If the dough is still sticky, add flour in small handfuls. 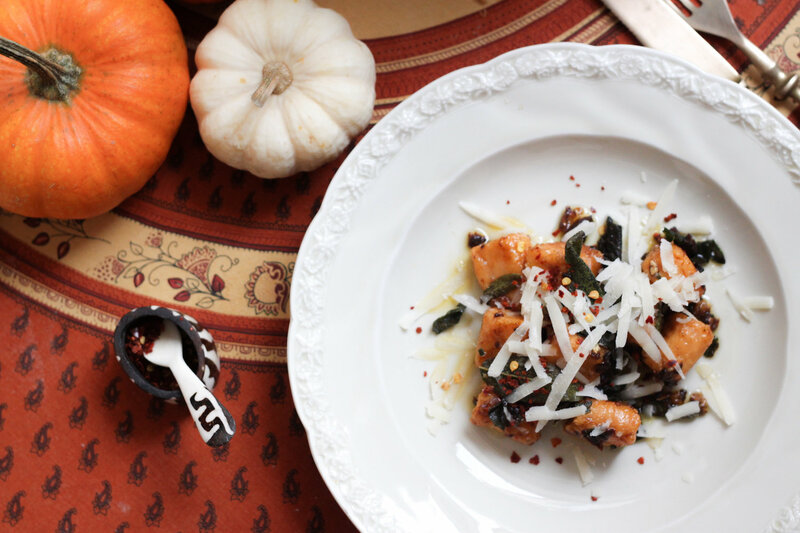 I added between 1-2 extra tablespoons of flour, but that amount may vary depending on the consistency of your sweet potatoes and the brand of ricotta you use. 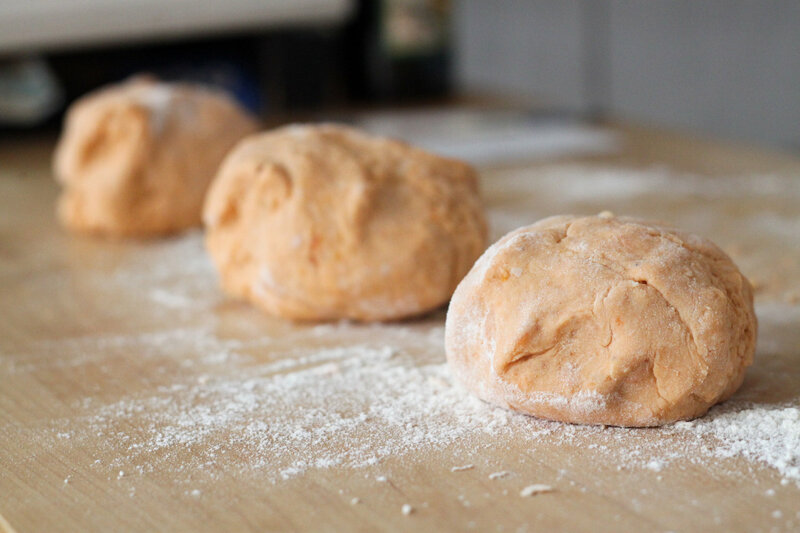 Divide the dough into three equal-sized balls. 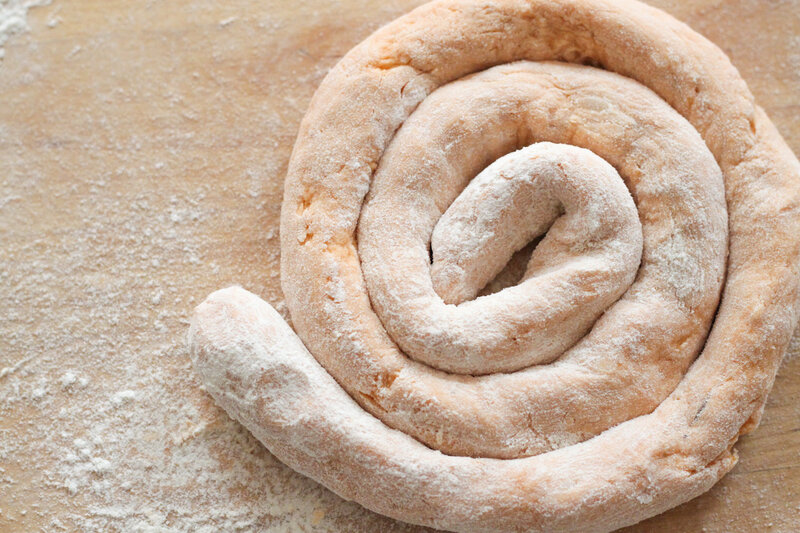 On a floured work surface, roll out one ball of dough at a time into a long rope about 1-inch in diameter. Cut the rope into 1-inch pieces. 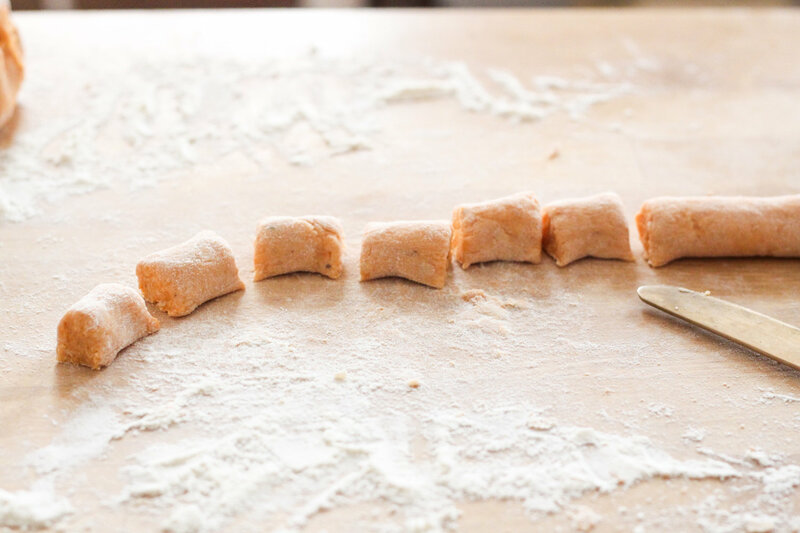 Using the tines of a fork, make ridges on all sides of the gnocchi. Not only is it more aesthetically pleasing this way, but the sauce will also do a better job of sticking in the ridges. Bring a pot of heavily salted water to a boil. Working in batches of about 10-15 gnocchi at a time, boil each batch for 6 minutes. Using a slotted spoon, remove to a lined baking sheet and allow to cool. 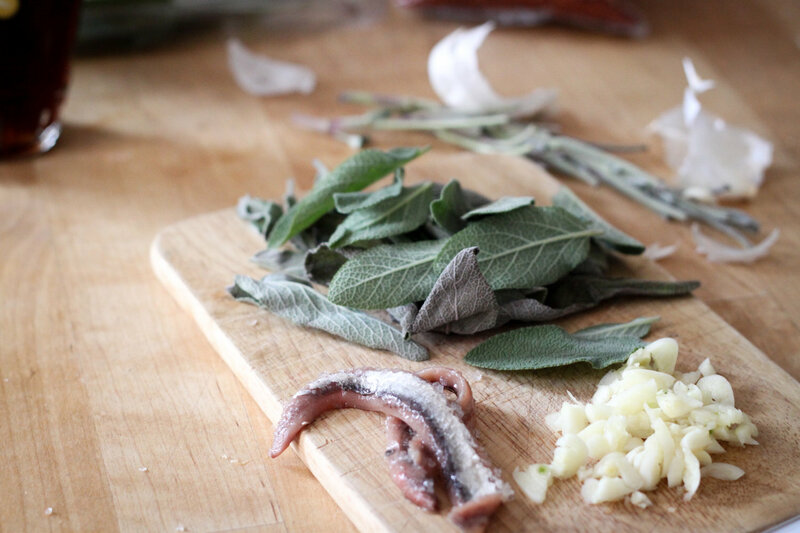 To make the browned butter, heat the butter and anchovies in a light-colored saucepan over high heat. The light colored bottom allows you to better monitor the butter’s color. Once the butter is bubbling and foaming, turn the heat to low and use a whisk to gently scatter the foam for about 7 minutes, until the butter slightly deepens in color. Add sage, garlic, and maple syrup, and gently whisk for another 6 minutes. Add the gnocchi to the butter sauce and cook until the gnocchi is warmed through and coated in sauce. 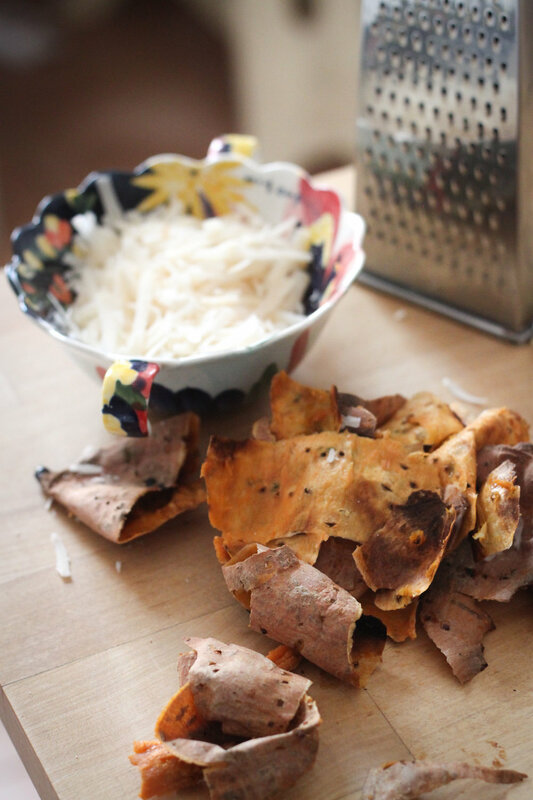 Serve topped with chili flakes and grated parmesan. I love the way, Lyz, you just cook up your own autumn golden.